When people live in houses, bungalows and flats they generate a lot of moisture by cooking, breathing, showering and drying clothes. This moisture is absorbed into the air and the amount of moisture that air can hold is dependant on temperature, the higher the temperature the more moisture. Unfortunately there is a limit to the amount of moisture that air can hold and when warm moist air cools it gives up some of this moisture. This cooling generally occurs in external corners of rooms or inside wardrobes where there is not much airflow. When this happens organic materials such as wallpaper, clothes, shoes and carpets may support mould growth. You may often feel that clothes and furnishing feel slightly damp and rooms tend to smell musty. Assuming the property is being heated satisfactorily then the solution is to provide adequate ventilation. Years ago natural ventilation was achieved by airbricks, open fires and ill-fitting doors and windows. Now we have few open fires, high performance double glazed windows and draft seals to our external doors. We are now less inclined to leave windows open because of the high cost of energy and possible security issues. In any event leaving windows is very hit and miss, can be costly in energy use with no guarantee or adequate ventilation. The sensible way to provide adequate ventilation and indoor air quality is by positive input ventilation units, in most cases one unit will deal with most properties. 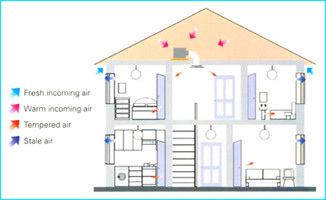 Positive input house and flat units are designed to control and reduce problems associated with condensation. These units are extremely energy efficient and introduce a measured amount of air to a central location and can transform a stale environment to one that feels fresh and healthy. In all cases it is essential for the property to be inspected prior to installation by a suitable trained person to ensure the correct positioning of the unit. Badly sited units will not perform satisfactorily and in certain circumstances can be dangerous to the health of the occupiers.